Hi Jeanne, Where can I purchase the purple grape-like tomato plants or seeds? Also, how do I prepare the soil and when is the best time to start planting? The purple grape-like tomatoes you saw Jeanne and Phil eating on the show are called gold berry tomatoes. Gold berries are an heirloom variety of cherry tomatoes, and actually start to turn more of a golden yellow color when they're ripe. If you're in the Chicago area, we recommend planting transplant seedlings between May 15 and July 15, and using a tomato cage. Green City Market is a great resource for purchasing tomato seedlings like these. You can find information about their seasonal hours and vendors on their website. 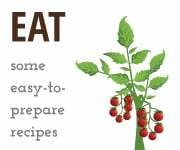 You'll also find additional tips for planning, planting, and harvesting these gold berries on the Crops section of WTTW's Homegrown Garden website, where specific information is listed for each crop we've planted at the WTTW garden this season. My tomatoes, in a pot, are little and are not getting any bigger over a period of 2 to 3 weeks. Also the leaves at the bottom of the plant are turning yellow. What do I need to do? Is it because Chicago has not had consistent sunlight? Help! Planting tomatoes in pots is a delightful way to get some gardening done in small spaces; however, they sometimes stay on the small side due to their cozy growing conditions. Depending on what type of tomato they are, they may be meant to be small. If they were a larger variety (like an heirloom or a slicing tomato), you may need to use a bigger pot next year to successfully grow large tomatoes. As for yellow leaves, pots lose nutrients due to water coming out of the bottom. Try applying a granular fertilizer. Keep in mind, however, that some yellowing is normal as the plant focuses on fruit production at the expense of leaf health. Chicago has had a cooler-than-usual summer, current temperatures notwithstanding. You are not alone in having frustration with tomatoes. Here's to a warmer summer next season! Thank you for inspiring me to build a raised bed vegetable garden. My site was the home of a 57-year-old Norway maple. (It was like losing a family member!) The stump has been ground out 2-3 inches below ground level. I am concerned about drainage. I was thinking 1-1/2" PVC pipe drilled with many 1/2" holes, wrapped with landscape fabric (to keep soil out) and extending 1' beyond each side of the bed. I think a total of 3 "drain pipes" spaced evenly along the 9-foot length of the bed would suffice. To keep insects out of the open end I would zip tie landscape fabric over the end. Any thoughts would be appreciated. Jeanne, I look forward to your segments with Phil Ponce. I've had an organic vegetable garden behind my garage for 28 years, but there is always more to learn. I have had good luck with actively aerated compost tea made from worm castings (from the book, Teaming with Microbes). Thanks. The PVC pipe idea should work well and will drain just fine, especially if your bed is raised 12" or higher. Thanks for sharing your plan, and good luck with your project! My asparagus are very infested with an orange beetle. The larva is eating the fern and destroying it. What can I do? Can I trim the plants to eliminate some of the larvae? These are asparagus beetles and they are indeed gross. Remove the gray-brown larvae and the eggs that are hanging from the frond, and place them in a bowl with soapy water (or, if you're not squeamish, squish them!). Try to remove the adults as well, though they are sometimes harder to catch. Planting petunias around the base of the asparagus bed is said to help. A fish emulsion and garlic spray can be beneficial, too - the garlic as a deterrent and the fish to strengthen the plant during its struggle. I was VERY surprised when you pulled open the cover on the WTTW garden to reveal growing veggies in early spring! When did you plant these veggies and how did you keep them from dying in the bitter cold? The plants we chose are known to survive the winter by slowing their growth down significantly during the colder, less sunny months. Not all vegetables are suited to this sort of growing, but spinach, kale, lettuce, Swiss chard, and other greens will delight in even the harshest of winters. We planted our cold frame at WTTW on September 22, 2014. 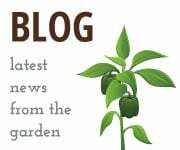 Each crop varies a bit on specific planting dates, but most just need to be seeded before September or October - read up on details for each season extension crop here at WTTW's crop page. The cover we provided the greens over the winter was able to prevent damage during the cold snaps. As soon as February and March came (and the days started getting longer), those plants accelerated their growth after the half-dormant winter sleep in the greenhouse-like conditions under the cover. And that is how those plants looked so big when we opened it up to harvest! I have a garden bed that becomes half-shaded by noon. What herbs and vegetables might thrive there? I had some oregano that did well last year, but not much luck with other plants in that area. Gardening in the shade can be very challenging, but there are some items that do well in shady areas. Since you have already had success with oregano, here are some more herbs that you may enjoy: anything in the mint family (including lemon balm, which makes a great tea), parsley, cilantro, and dill. Lettuce and any greens that you would harvest young (like mustard, baby kale, tatsoi) would also do well. In shady areas, always be sensitive to watering. Since the sun will not dry out the soil as quickly, err on the side of under-watering. Finally, if you have at least five hours of sunlight, you may be able to do cucumbers. The smaller flowers of cucumbers allow for a decent yield, even in a shadier garden! I just want to know how so many plants could survive and mature in the WTTW garden given the harsh conditions and lack of bright sunny days we had this past winter? The plants we chose are known to survive the winter by slowing their growth down significantly during the colder, less sunny months. Not all vegetables are suited to this sort of growing, but spinach, kale, lettuce, Swiss chard, and other greens will delight in even the harshest of winters. The cover we provided the greens over the winter was able to prevent damage during the cold snaps. As soon as February and March came (and the days started getting longer), those plants accelerated their growth after the half-dormant winter sleep in the greenhouse-like conditions under the cover. And that is how those plants looked so big when we opened it up last week to harvest! Hello, help my mom with her generous 4x8 raised garden bed at The Moorings. There are about 100 gardens and gardeners in this community with raised beds and tabletop gardens. What would you suggest as a layout for 4x8 to utilize the most of the space? I am interested primarily in tomatoes, arugula, lettuce, carrots, beets, and cucumbers. Great question! Sometimes, utilizing some vertical space will help you maximize your growing area. Additionally, planting around your main focal vegetables will help you gain even more growing space. For example, growing tomatoes and cucumbers on cages will keep those items up and off the ground, allowing you to use the space around them for lettuce, carrots, beets, and arugula. Don't be afraid to seed arugula and lettuce close to your tomatoes and cucumbers, as leafy greens don't require much root space. The final tip for maximizing your space is the concept of “succession” planting. Items like arugula, lettuce, carrots, and beets can be planted all season long. If you seed those items in small sections, once a week or once every two weeks, you will be able to harvest in waves throughout the season. By the time you are harvesting from your last section, you may be able to seed again in your first section, and so on! Bought cheap top soil to put in garden last year. What a mistake. It was full of crab grass and weeds. Fought them all last year. It was a losing battle. They are back again this year. How do I get rid of them before planting? Do I have to start over again or can it be saved? I do not want to have the best weed garden in the neighborhood this year. It is a battle, but with some persistence, you don't have to start again. We don't usually recommend using plastic mulch but for this problem, we think it will be your only solution! Start by laying some black plastic (even large garbage bags will do!) over the areas with the worst weeds to smother them. After 10 days, uncover and work the soil to remove the weeds. Then, fertilize with an organic granular fertilizer or bring in some compost, enough so that you can cover the area of your garden with ½-inch of compost. Work the compost in and smooth your soil even. Then, wait another week to 10 days, and allow the next batch of weeds to emerge, and then just work the top layer of soil to remove the next batch of weeds. After that, plant as you normally would. In order to minimize weed pressure, we recommend mulching with straw, leaf mulch, or if not annual vegetables, hardwood mulch. That will help keep the weeds down for the rest of year. Finally, stay on top of any weeds that emerge. If you get to them early and often, you will have a lot less weed pressure next year. Never let any weeds go to seed, and be sure to remove as much of the roots of the weeds as possible. They can easily sprout again if you just pull the green tops of leaves and don't remove the root. I'm wondering about bringing my bell pepper plants indoors. They are still producing fruit and with the first frost coming, I'm hoping to prolong their producing! Any suggestions would be greatly appreciated. It's always tempting to bring those still flowering plants in! If they’re already in a container and you have a warm, sunny spot for them, then it may be worth a try to allow a few more peppers to ripen. A cover over the peppers at night until our first frost may also work to hasten ripening. We put in raised beds this year and had a wonderful harvest - except for the zucchini. The plants were wonderful in the spring and grew very big, and then the vine borers killed them quickly. So sad. What can we do next year to avoid this problem? Most of the solutions I've read said grow other squash, like pumpkins. Not the same! We have not used any chemicals in the garden, so I'm not sure what to do. We live in Chicago. What is the best solution? Squash vine borer can be a real challenge! Wrapping the stem at the soil line with foil has helped us cut down on squash vine borer damage. Once the larvae are in the soil, they can live in the soil over winter and affect your zucchini next year. We have seen damage done to pumpkins, as well. Another control method would be to plant seedlings instead of direct seeding. Some farmers have said that helped with crop loss. Finally, try planting a later crop of zucchini, in early to mid-July, which is generally after the borer is most active. 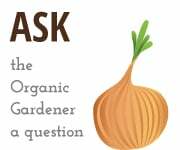 Do I have to use organic soils in order to grow organic foods? Where do I buy this soil? Where do I go to get the good quality seeds? Do you have any good recommendations? We obviously love organics here at The Organic Gardener. There is, however, a difference between a home gardener using organic practices and the "organic" produce you may buy from the store. Grocery store organic produce has been certified "organic" because the farmer practices organic methods defined by the USDA and fulfills other vigorous requirements in order to sell vegetables labeled "organic." As a home gardener, your focus is about growing safe and healthy foods rather than marketing it for sale. The soil you already have, unless contaminated with heavy metals or chemicals (determined by a soil test), can be used to grow high quality fruits and vegetables. The addition of compost may be all you need to improve the overall health of your soil to grow safe and healthy food. There are different types of compost, we like the type that is certified organic and locally made; look for Organimix or Cowsmo. If you are growing in a pot or some type of container with a bottom, we recommend a bagged organic potting soil mix available at most independent garden centers. We often use a brand called Happy Frog for containers. You can procure organic seeds from online sources like Johnny's Selected Seeds, Seed Savers Exchange, Baker Creek, High Mowing, Seeds of Change, and Pleasant Valley. There are many other seed companies, and you may find one that you like more than others. Some local garden centers also carry certified organic seed. Hello Jeanne, I have a small backyard garden where I grow an assortment of vegetables each year. I also make compost from my food scraps and leaves, etc. Now that fall is fast approaching, can you tell me if it the time to spread the compost on the garden or should I wait until the spring? Layering your garden with your finished compost for the fall is a good method. This will allow the compost to release nutrients into the soil slowly over the winter and early spring before the next planting cycle. It can also be done in the spring, but using it in the fall allows you to make room in your compost bins for the fall plant matter. What do edible nettle leaves look like? I saw some used in salad on a cooking show. It looked similar to a weed in my garden. Do you have a picture of some? Is there any other type of test to be used in identifying it? I judge it is bitter tasting, so a little goes a long way. Are there any poisonous/toxic varieties? I think what you are referring to are stinging nettles. Here are pictures and some culinary uses. We are not aware of toxic varieties, but they do have to be cooked to be eaten. It's very unpleasant (i.e. painful) otherwise. The website listed above also has useful pictures of other sorts of edible weeds. Stinging nettles are not something we have cultivated for our clients, but as long as you are not spraying pesticides/herbicides in your garden, most everything should be safe to eat. I'm hoping you can advise me regarding tomato plants. I've recently heard that I should be removing some of the stems on my tomato plants. How do I tell which stems should be removed and which one should be left to grow? When should this pruning take place? I will be grateful for any help you can provide. There are a lot of philosophies regarding pruning. Some people say you should always prune and are quite drastic, removing all but one main branch. That approach requires pruning all summer long and a major support system. That is unrealistic for the home gardener. Some people say you should never prune. Our approach is somewhere in between. If the plant is getting unwieldy and interfering with other plants in the garden, it may be time to take some stems out. If you do remove some stems that have leaves and flower stalks, it will likely be from the bottom of the plant. These are new stems that develop over the course of the summer at the base of the plant. They will be unlikely to produce much fruit. On the other hand, if you are asking about removing yellow or brown leaves on just leaf stems, you can always prune those off. Not only is it aesthetically pleasing to do so, but it is also healthier for the plant. If you do prune, make sure to sanitize your pruners with a 10 percent alcohol solution between plants. And again, it is not necessary to prune, and there is no right or wrong answer. You will have to experiment and see what you are comfortable with! I saw you on Chicago Tonight this evening and you mentioned an organic pesticide. I was wondering if you could recommend an organic herbicide. I have a very invasive persicaria in my yard. It spreads by the root system and by birds distributing its seeds. I keep cutting it down but it returns aggressively and is everywhere. Funny thing is, many years ago, I saw the plant at the edge of a woods and thought it was beautiful with its form and its white seed heads. Looks like I got what I asked for and more! Any advice you could give would be greatly appreciated. While there are "organic" herbicides, there are no herbicides that are "selective" in what they kill. In other words, any plant, regardless of their desirability, will be killed if you apply an herbicide. The only non-chemical way to rid your garden of this pesky weed in the knotweed family is to recognize the leaves and pull the plant before it flowers. As for spreading by roots, you have to be persistent and vigilant, and remove the weed and as much of the root as possible. Checking weekly for signs of reemergence would not be too much. Weeding early and often will help alleviate some of the weed's invasive nature. Additionally, following a thorough weeding, applying a mulch may also help suppress the spread of this weed. Our tomato plant bottom leaves are turning yellow with brown spots. How do we fix this problem and what is it called? This is fairly common this time of year. Your plant may be fine and continue to thrive. On the other hand, yellowing and browning leaves can be caused by a number of problems, from nutrient deficiency to bacterial or fungal diseases. Most likely, you are facing early blight, which is a bacterial infection that has been exacerbated by our incredibly wet and fairly cool summer. You should side dress your plants with an organic granular fertilizer and/or drench the roots with an organic fish emulsion, both of which can be found in a good quality garden supply center. This will help strengthen the plants with readily available nutrients and give their immune systems a boost. You can also carefully remove badly diseased leaves at the bottom by using a pair of pruners or shears and cut close to the stem (But not so close that you do damage to the main stem). Ultimately, none of these approaches will cure your plant once it has been infected. At this point of the season, you should focus on controlling further spread of the disease. Will marigolds keep squirrels from raiding gardens? It’s unlikely. The only thing that completely works with squirrels is a barrier of some sort (nets, cages, chicken wire, etc.). A few other options are to use cayenne powder sprinkled around the garden and on plants that they like (such as tomatoes). This method is touchy if working with kids. There is a product called Plantskyyd that sometimes works. You can also spray your plants with a garlic concentrate. We use one called Garlic Barrier; this produces a smell that deters them. I have a raised garden (6'x20'). I grow tomatoes every year and till in compost every fall. Does soil ever "wear out?" Should I be adding anything else to keep nutrients in the soil? Soil does wear out. Each season the plants withdraw nutrients from the soil and it's up to the gardener to replenish the soil annually. This is done by aerating the soil and adding a generous application of compost. It sounds like you are already doing this. Additionally, we suggest adding an organic granular fertilizer. This can be worked into the top 6 inches or so of your entire garden bed before you plant in the spring. There are several good brands available locally at garden centers. We like Dr. Earth and the Fox Farm product line. The bag will say Organic Fertilizer for Vegetables. The application directions are on the back. I've tried growing pole beans/runner beans (Scarlet Emperor) in 15" x 15" x 18" high wooden boxes on my south facing rooftop deck in Chicago. They have flowered profusely and look very pretty, but the beans never set until late in the season when it gets a little cooler. I've tried spraying and hand pollinating, and insects do visit the flowers but to no avail. Is this just a temperature thing as it gets very hot in high summer? I'm now working on rhubarb in the same tubs and they do reasonably well until it gets very hot and then they start to flag. Any help would be much appreciated. It could be a heat issue, but it could be a pollinator issue, even though you say that there are insects visiting. Try applying an organic granular fertilizer to the area you are growing the beans and see if that corrects any potassium issues that may be contributing to failure to fruit. You may not see an improvement until next year. As for the rhubarb, they do hate heat. Make sure you are deeply watering the rhubarb during the high summer, and do not harvest after July 1. The leaves will wilt in the heat to protect themselves somewhat, but do make sure it is well-watered during the hottest and driest times of the summer.